South of Paris, France is the Loire Valley where the rich and famous used to come to relax. 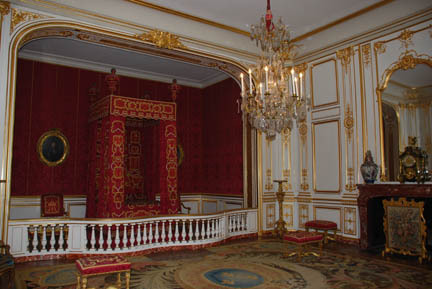 Various French kings through the 14th to 18th centuries had various chateaus to use for their country houses (yes that is plural, they had more than one place to relax in while the peasants paid the bill). We set up our "Chateau Eggett" in a campground on the Ile d' Or, an island in the Loire River in the town of Amboise, France. We'll use this as a base for further explorations and do some much needed repairs to our gear. Our first visit is to the Chateau Amboise, walking distance away across the bridge. This chateau was built on the foundations of an earlier castle. We found that to be true of several of the chateaus around here. Only about 20% of this chateau remains. The rest was destroyed by Napoleon and the French Revolution. It used to stretch the entire width of the wall you can see behind the houses along the riverfront. Leonardo da Vinci was hired by King Francois I when he (Leonardo) was 64 to design buildings and other things for him. He died here three years later and is buried in the chapel whose steeple you can see to the right of the main building. The following day was spent in repairs and maintenance of our clothing and gear. It wears out when you use it on a daily basis when it was meant for intermittent use. We replaced the hinges on the lid of the trailer, glued together places where the tent was coming apart, fixed the foot peg on the bike and figured out what was wrong with the low beam headlight (we ordered the part when we got to Paris) and repaired the zipper on a pair of my pants. This took several trips to the hardware store and most all of the day. There are a lot of chateaus in the Loire Valley. It was a popular spot for the rich, and friends of the king, to hang out during the 14th and 15th centuries. We limited ourselves to a few of the biggest and most famous chateaus. We went first to Villandry, the chateau with the famous gardens. A water garden, a lover's garden and a kitchen garden. This chateau was built on and around a former fortified castle. The lover's garden is in the foreground, the kitchen garden to the rear and the water garden is to the upper left behind the row of trees pruned like a hedge. The water garden is really only a square reservoir with grassy walks around it. It is used to supply the rest of the gardens with water. 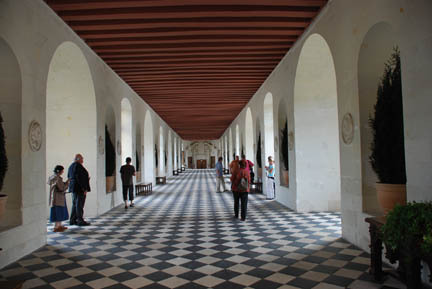 Then we went to Chenonceau, famous for its location. This chateau was built on the foundations of a fortified mill on the River Cher. (The mill was torn down to build the chateau. There is a drawbridge between the tower and the chateau's main building. The long part over the river is a long hall and it intended to have a matching building built on the other end. It is claimed that this was a bridge to freedom during WW II because the Germans controlled this bank but not the other side and the French would sneak across the river through the chateau. Other sources claim that to be a "tall tale" of dubious truth. The long hall over the river where the parties were held (and the French are supposed to have escaped the Germans). The fireplace in the far end is really a door (and not hidden at all). 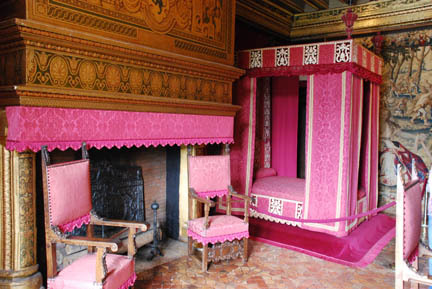 One of the bedrooms in the chateau. 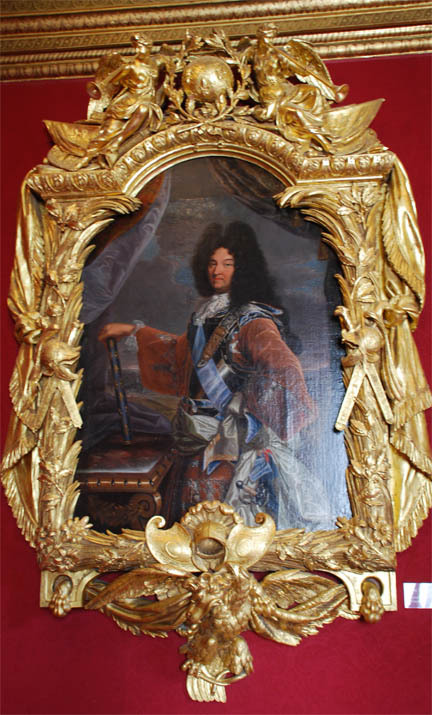 This chateau was mainly owned, or lived in by women, the queens of the French kings, or their girlfriends. The last was Catherine de Medici. On the way to Paris we stopped at one more chateau, Chambord. King Francois I decided that the hunting was very good in this area and that he needed some place to sleep when he went hunting, so he built Chambord. He spent only a total of forty nights in it! It was not quite finished when he died and was abandoned for 80 years. Over the years from the 1400's various kings fixed it up until Napoleon abandoned it for good. Later the French government got it and is still working on restoring it. The main building consists of four round towers connected by wide halls in a square pattern (you can see two of the towers in the center of the picture). A double helix spiral staircase climbs the center of the whole building giving access to all the floors. The staircase has an innovative hollow center that allows light from the windows on the roof of the center tower to spill down to the ground floor lighting up the staircase and the center of the chateau. We arrived in Paris that afternoon and found the campground that is in the city park by the River Seine. It is a nice park but not the 4 stars that they claim, and very expensive!. We are paying more for a campsite here than it cost in Rome or Pompeii for a bungalow. Anyway, on to Paris for our next adventure.